If you need a quick and easy breakfast option around the holidays, this Orange Glazed Cranberry Bread Recipe is the solution! 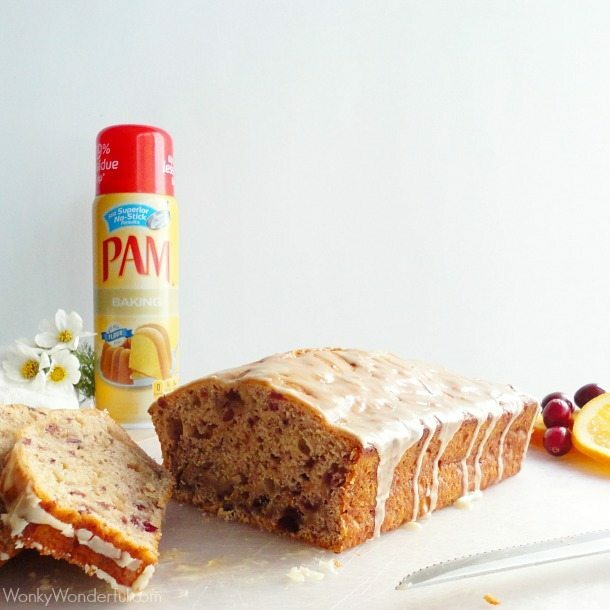 This moist quick bread is bursting with tart cranberry flavor and the orange glaze adds the perfect blend of sweet citrus. I absolutely love making quick breads. The flavors and ingredients can easily be changed to fit my needs. 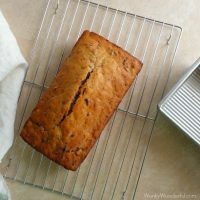 I use this basic quick bread recipe and switch out the type of dried fruit depending on my mood. Nuts can be added and the glaze can be made in a variety of different flavors. 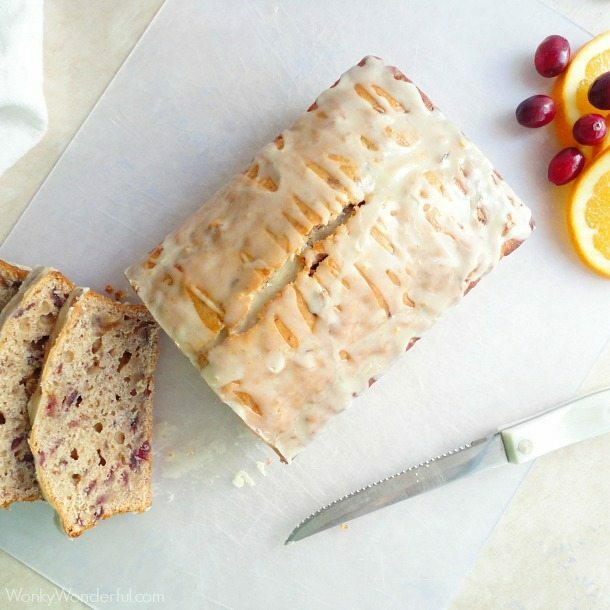 Wrap up some loaves of this Orange Glazed Cranberry Bread for holiday gifts. Or enjoy it as a breakfast treat with the family. 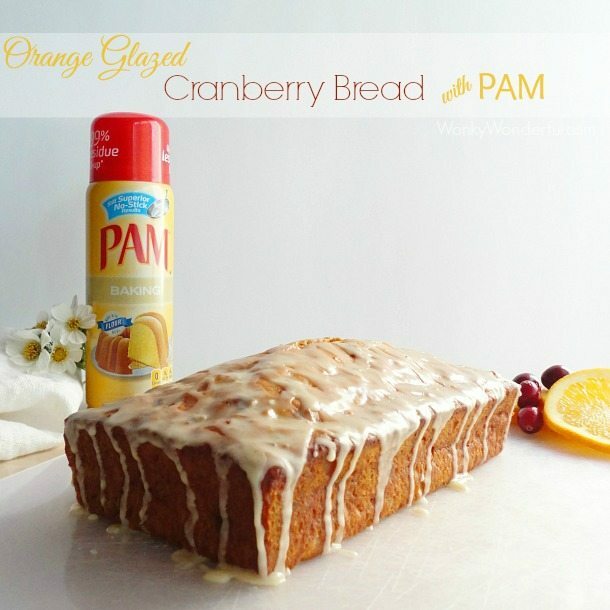 I had the opportunity to use Baking PAM Spray. 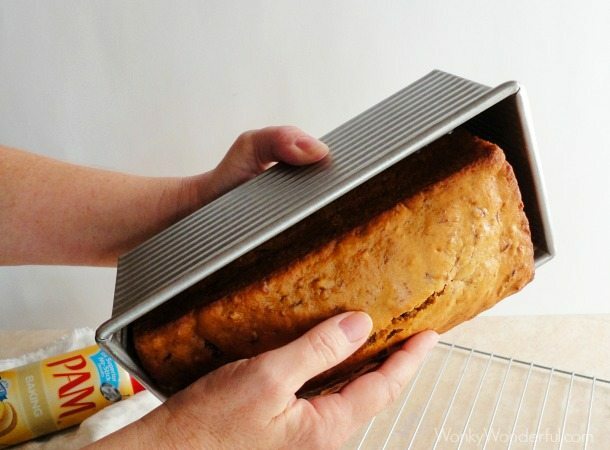 Not only does PAM Cooking Spray now leave up to 99% less residue buildup, but it ensures that your quick bread will slip right out of the loaf pan looking perfect. It’s a total bummer when you make homemade cake or bread only to have it stick to the pan, especially when you have hungry family members expecting a holiday treat. No need to worry about the ‘stick’ factor as long as you spray the pan with a generous coating of PAM! And that means you’ll be spending less time scrubbing sticky dishes too! Another awesome way to use PAM Cooking Spray is to spray the measuring cup before filling it with honey. Then the honey slides right out of the measuring cup without a hassle. I use that trick a lot! Back to this perfect loaf of Cranberry Bread. It is ready to be GLAZED! 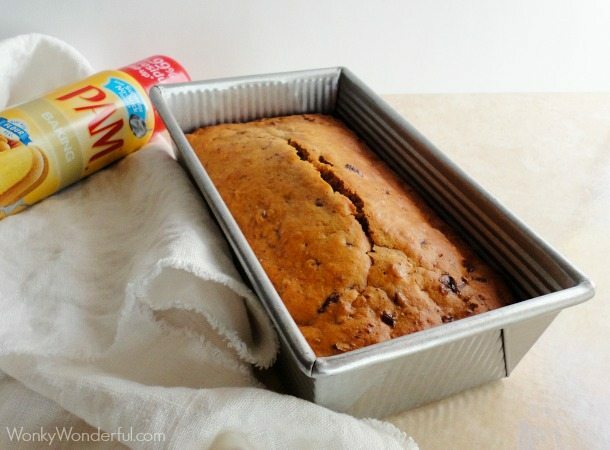 Generously spray a large loaf pan (9x5x3) with PAM Baking Spray (or Original PAM). Finely chop dried cranberries in a food processor. Combine chopped cranberries, baking soda, butter and boiling water. Set aside. In a separate bowl - sift the flour and baking powder. While mixing - add the cranberry liquid to the egg and honey mixture. Mix until fully incorporated. Slowly add the dry ingredients and stir until no dry clumps remain. Do not over mix. Transfer batter to the greased loaf pan. Run the tip of your spatula lengthwise down the middle of the batter to create the crack at the top of the bread. Bake for 40-45 minutes or until a toothpick can be inserted and removed clean. Remove from oven and allow to cool in pan for 5-10 minutes. 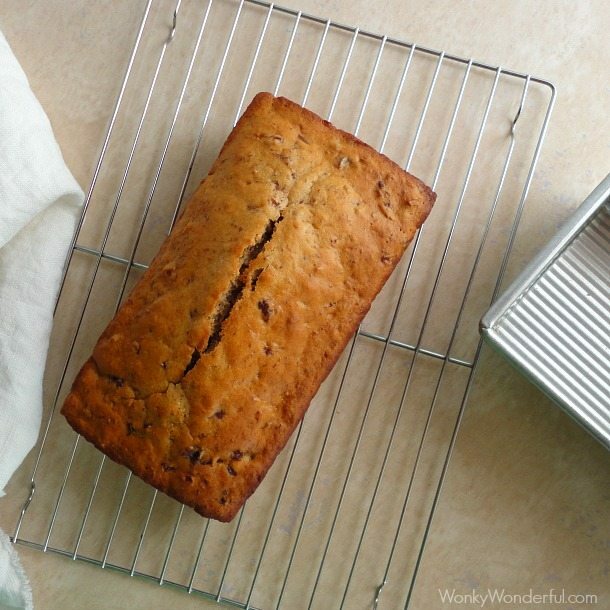 Using a potholder or towel - gently flip the loaf pan upside down and catch the cranberry bread with the other hand. Cool on a wire rack for at least 15-20 minutes. While the bread is cooling prepare the glaze. Stir the powdered sugar, orange juice and zest together with a fork. Drizzle glaze over the top of the cranberry bread. Allow glaze to set for 10-15 minutes. Slice and serve OR package and give as gifts! Here is an interesting add in: Crush dried thyme into a powder and add about 1/4 tsp to the glaze. It adds a slightly savory element. Taste test on a small portion before adding thyme to the entire batch of glaze. 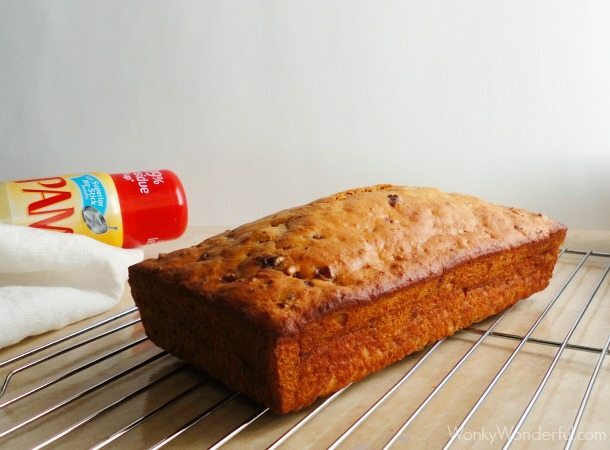 I adapted this recipe from the Maple Date Nut Bread recipe in Eet Smakelijk. This Cranberry Bread Recipe is one of my holiday favorites. 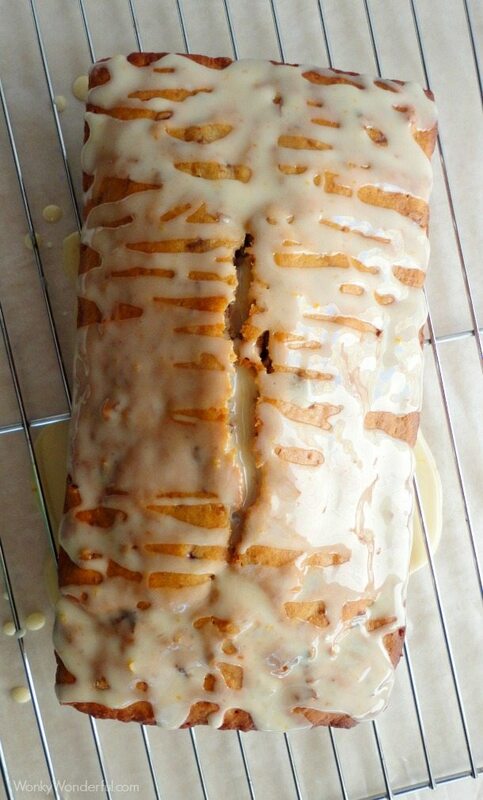 Add the Orange Glaze for breakfast perfection! I hope you and your loved ones enjoy this tasty quick bread as much as my family. Please read the Terms & Conditions before entering this giveaway. All entrants must be 18 years+ and reside in the continental U.S. This Giveaway Has Ended – Congratulations Laurie M.
Hands down, it would have to be my mom’s fried chicken. No one makes it as good as she does. My grandmother’s chicken pot pie. It’s so simple, but that flaky piecrust and perfectly spiced chicken and veggies makes for the greatest comfort food. Cold, leftover pie. I could eat it for any meal! I love Cherry Cheese Pie! My favorite food would have to be pork enchiladas right now. We used smoked pulled pork and homemade enchilada sauce. So yummy and creamy! My favorite food is Beef Wellington. My favorite food is grilled rope sausage. Eat it plain, on a bun or tortilla, you can’t ruin it. i love braised short ribs. Oh, my favorite is Ice Cream too! My absolute favorite food, no lie, is cranberries. A few years ago I would have said potatoes, but I had a serious kidney scare and cranberries are a super food for the kidneys. I make sure to eat cranberries and drink cranberry juice every single day. That recipe looks great, I love this flavour combination! However, I *much* prefer parchment paper over PAM. The stuff is great: less concern about potentially harmful chemicals/synthetics, and a wide variety of uses. 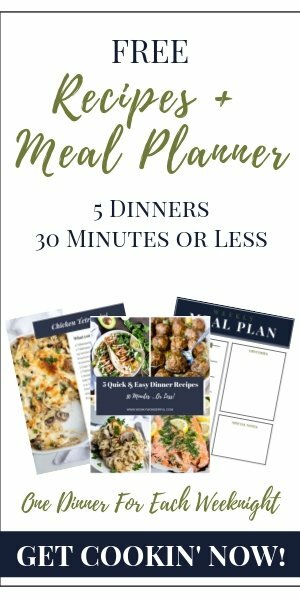 Not only can you line baking pans with parchment paper, but you can also employ it in bread baking (specifically the overnight, yeasted no-knead variations), and when making your own pizza on a baking stone. Simply assemble your pizza on the paper, and lift the entire thing by the edges of the paper onto the stone. No need for a slider and no worry about sauce and goo running onto the stone.